The Joseph Schlitz Brewing Company dates back to 1856 when Joseph Schlitz took over the small brewery he worked at after the death of the original owner. 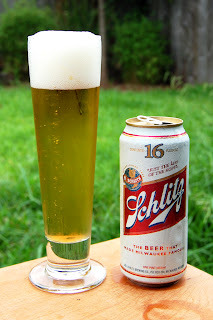 Schlitz, eventually known as "The Beer That Made Milwaukee Famous," would become one of the most dominant brands of beer, and the Schlitz company was the largest producer of beer in the world at various points throughout the first half of the 20th century. After its peak in the 70's, however, Schlitz faded into near-obscurity, becoming a shadow of it's former self and serving as a budget beer. However, with the revival of throw-back heritage brands over the last few years, Schlitz is on the rise again. In addition to the budget formulation of Schlitz being reviewed here, there is also a version based on the 60's formulation in circulation now. Let's hop in the wayback machine and see what made Milwaukee so "famous," shall we? Appearance: A crystal-clear golden body capped by two fingers of fluffy white head that feature good retention and patchy lacing. Looking good so far. Aroma: Faint grains and equally faint lemony hops. Rather standard. Taste: The flavor profile is a balance of sweet, grainy malt and lemony and grassy hops. There’s also a metallic flavor lurking around the edges. It’s balanced well, but still rather weak. Just a bare whiff of husky grains in the clean finish. Mouthfeel: Medium bodied with medium-high carbonation and a crisp finish. Drinkability: Average for the style. That is to say, for fans of the flavor, this is an exceedingly easy drinker. Verdict: While I held some hope that perhaps Schlitz was something more than the offerings of the big three (and that hope seemed vindicated upon seeing the beer in the glass), alas, it’s just the same old crap. Still, I hold lots of hope for the 60’s formula version that's available now.